WHAT does the air you breathe in, electricity, and the airship Hindenburg have in common? It’s hydrogen – the chemical with the H symbol and atomic number 1, and Hyundai is hoping this halo gas can propel its cars to the top of the hybrid pile. Torque was given a peek at the 2019 Hyundai Nexo, the Korean automaker’s latest foray into the fuel cell vehicle market, and its latest attempt to build a car which looks like an everyday internal combustion vehicle but with none of their sins. The Hyundai Nexo’s sleek lines belie the hydrogen that lies beneath. Nothing about the car screams “hydrogen fuel cell vehicle” when you step up to it. But open the bonnet and the four-door SUV gives up the ghost. Nestled inside the engine bay is a hydrogen fuel cell, coupled to a bank of batteries in the rear. The batteries, in turn, drive an electric motor powering the front wheels. Range and refuelling time are two strengths of a hydrogen fuel cell vehicle. Conventional all-electric vehicles can spend anywhere from half an hour to a whole day sucking up juice from a power socket, thereafter giving you a range anywhere from 330km to 400km (Tesla’s top of the line P100D electric stormer has a range of 507km – if you don’t drive like a bat out of hell). 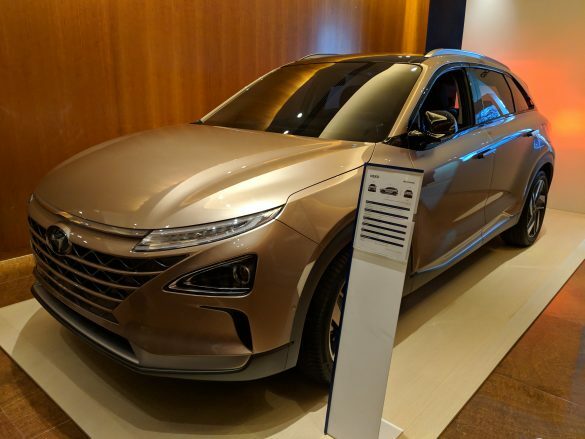 The Hyundai Nexo, on the other hand, has a stunning near-700km range between refills of hydrogen, which take only 3 – 5 minutes to complete, according to a Hyundai engineer at a media event. The fuel is packed into three 700-bar (10,000 psi) tanks which hold a total of 6kg of hydrogen. Contrast that with the old Hyundai Tucson FCEV, which had 30 percent less range and a slower 0-100km/h time. The car is powered by hydrogen, and emits nothing but water. Zero emissions is the car’s raison d’être. Nothing but water vapour comes out of its tailpipe, and that doesn’t come at the expense of acceleration, with the Nexo able to hit 100km/h in a sprightly 9.5 seconds with its 160hp electric motor and 291 pound-feet of torque. The Hyundai Nexo is designed to handle “extreme” temperatures and operating environments. 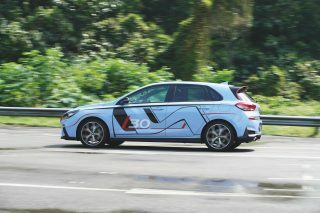 In testing, the vehicle could start after being subjected to -29 degrees Celsius, according to Hyundai. The Hyundai Nexo has an industry-leading “cold start capability within 30 seconds”, and the fuel cell system “warms up faster for maximum performance”, Hyundai said in a press statement. Meanwhile, those who remember the airship Hindenburg exploding in all its glory can rest easy. 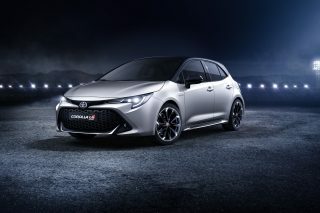 If the car detects a hydrogen leak (which is “unlikely”), sensors automatically shut down the engine, preventing further damage. Safety features also extend to a crash. 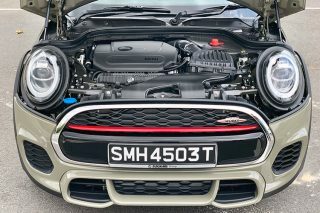 In the event of a rear-end collision (the tanks are stored below the trunk space), a pressure relief valve can release all the car’s stored hydrogen in under a minute. In keeping with its futuristic nature, the Hyundai Nexo incorporates several technologies, among which is a blind spot view monitor, which provides a wide-angle video view of spots which normally cannot be seen by a traditional rearview mirror. Hyundai’s lane-keep assist also makes its debut in the Nexo, keeping the car in the middle of the lane by making small adjustments to steering input, and operates at speeds between 0 and 145kmh. If parking during your driving test conjures up nightmares, the Hyundai Nexo has you covered too. 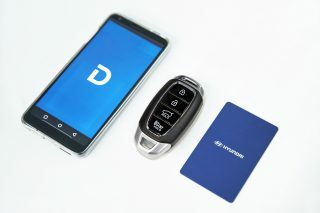 Its Remote Smart Parking Assist (RSPA) lets the car autonomously park or retrieve itself from a parking space with no one in the driver’s seat, saving you time and face. 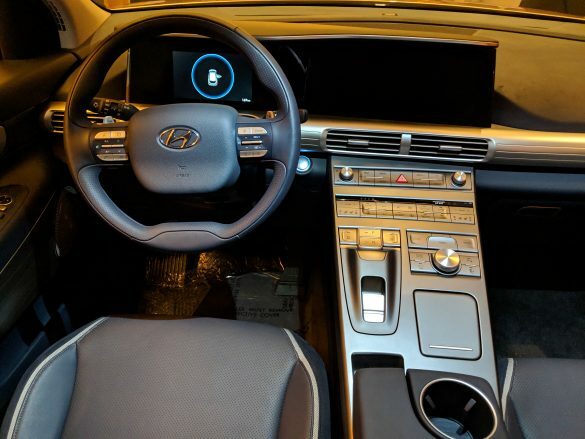 The Hyundai Nexo’s sleek and modern interior is dominated by two interior screens which can be configured to show video of the vehicle’s blind spots. 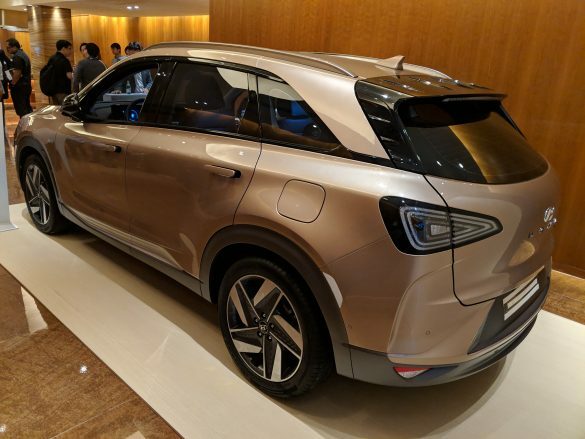 Sadly, the Hyundai Nexo won’t go on sale in Singapore any time soon, confirmed local distributor Komoco Motors, due to a lack of a hydrogen refuelling infrastructure. However, Hyundai is still aiming to build 18 eco-friendly models by 2025, a roadmap which represents the automaker’s commitment to reducing its carbon footprint. “Hydrogen energy is the key to building a more sustainable society. 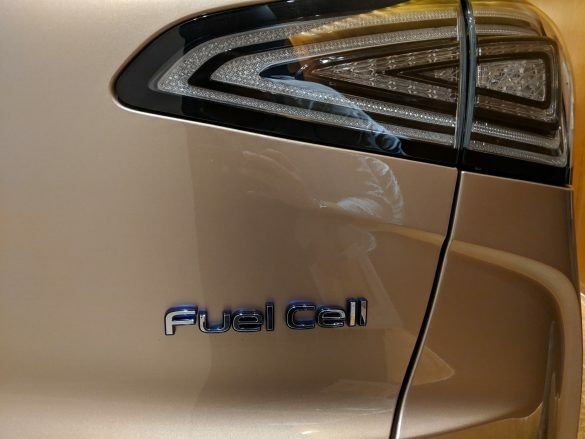 Hyundai Motor Company has already taken a lead in hydrogen technology with the introduction of the Tucson fuel cell (vehicle),” said Hyundai’s vice-chairman Woong-chul Yang, adding that its second generation fuel cell electric vehicles are a “culmination” of the company’s “cutting-edge technologies”.